Released in August from the same publisher as Small Mart Revolution. 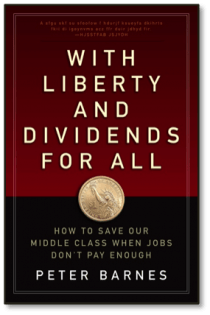 According to the book’s website: “This book contends that paying dividends from wealth we own toge­ther is a practical, market-based way to assure the survival of a large middle class. It can be implemented by electronically wiring such dividends to every legal resident, one person, one share. “THE CORE OF THIS IDEA isn’t new. Thomas Paine, the patriot who inspired our war of independence from Britain, proposed something quite like it in 1797. And Alaska has been running a version of it since 1980. The main things that would be new are the scale and the sources of income. “This old/new idea is ready for prime time for two major reasons. One is the lack of alternatives. Our current fiscal and monetary tools can’t sustain a large middle class, nor can increased investment in education, infrastructure, and innovation. None of these old palliatives address the reality that for the foreseeable future, there simply won’t be enough good-paying jobs to maintain a large middle class. “A second reason is the current stalemate in American politics. Solutions to all major problems are trapped in a tug-of-war between advocates of smaller and larger government. Dividends from co-owned wealth bypass that bitter war. They require no new taxes or government programs; once set up, they’re purely market based. And because they send legitimate income to everyone, they can’t help but be popular among voters of all political stripes. Herb E Smith and others have proposed exactly this idea (based on coal extraction) as the way to build a middle class in Central Appalachia.